Mack Trucks will display two Mack Anthem® models (seen here), one Mack® Pinnacle™ model and one Mack Granite® model in booth 4259 at ExpoCam April 11-13 at Place Bonaventure in Montreal, Quebec. Two Mack Anthem models, along with one Mack Pinnacle model and one Mack Granite model, will be featured, each powered by the 13-liter Mack MP8 engine. Each truck is also equipped with a standard Mack mDRIVE automated manual transmission (AMT), including the rugged mDRIVE HD variant found in both the Pinnacle and Granite models, as well as in one of the Mack Anthem models. 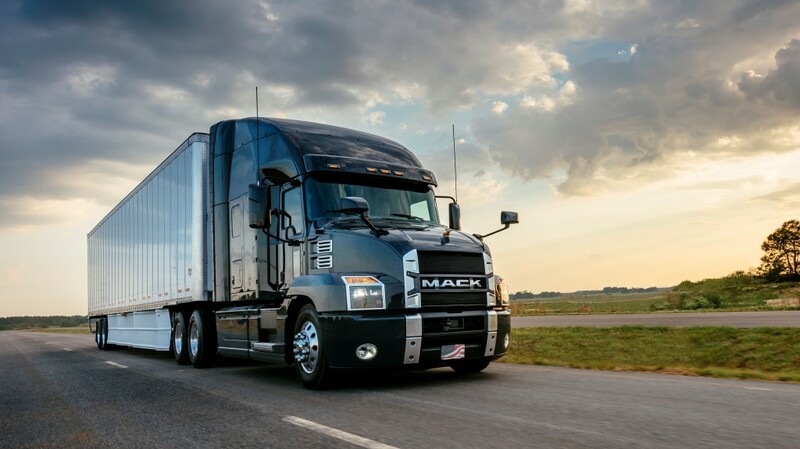 Additional features: Mack in-dash infotainment system with backup camera support; Mack GuardDog Connect integrated telematics; Mack ClearTech One exhaust aftertreatment system; Mack FXL13.2 13,200 lb. front axle; Bendix Wingman Fusion; Mack premium seats developed with Sears Seating; full LED interior and exterior lighting. Additional features: Mack GuardDog Connect integrated telematics; Mack ClearTech One exhaust aftertreatment system; Mack FXL12 12,000 lb. front axle; Bendix Wingman Fusion; Mack premium seats developed with Sears Seating; full LED interior and exterior lighting. Additional features: Mack GuardDog Connect integrated telematics; Mack ClearTech One exhaust aftertreatment system; Mack FXL14.6 14,600 lb. front axle; Mack premium seats developed with Sears Seating; full LED interior and exterior lighting. Additional features: Mack GuardDog Connect integrated telematics; Mack ClearTech One exhaust aftertreatment system; Simard twin steer front axle; Mack S462R 46,000 lb. rear axles; Mack premium seats developed with Sears Seating; full LED interior and exterior lighting. A record 14,256 industry professionals from 28 countries attended The Work Truck Show 2019 as Work Truck Week continues to grow in an evolving commercial truck industry. Event highlights included vehicle introductions, equipment demonstrations, expanded educational opportunities, and the industry's broadest display of vocational trucks and equipment. Visitors to Bauma will be treated to an electrifying experience at the Wacker Neuson and Kramer stand FN.915. In addition to showcasing an assortment of products, the stand will feature a 35-meter high big wheel that will give visitors a unique view of the two brands' 6,000 square meter exhibition and demo space as well as the surrounding exhibition grounds. Aggregates and asphalt industries were out in force at the record-setting World of Asphalt Show & Conference and AGG1 Academy & Expo, Feb. 12-14 at the Indiana Convention Center in Indianapolis. JCB will exhibit a range of rental-ready machines at The Rental Show 2019, hosted by the American Rental Association in Anaheim, California from February 17 to 20. Hyundai Construction Equipment Americas held their Annual Dealer Meeting on February 5, 2019 in conjunction with the 2019 AED Summit in Orlando, Florida February 4 -7. The AED Summit is the premier industry event where construction equipment distributors, manufacturers and service providers are able to connect with peers from over 500 companies under one roof. Manitou North America will showcase rental solutions across its Manitou, Gehl and Mustang by Manitou brands at booth 6357/6353 at The ARA Show in Anaheim, California February 17–20. IndyCar Series Driver and Manitou North America Ambassador Graham Rahal will also host a meet and greet event at the booth on Monday, February 18, from noon to 4 pm. The International Powered Access Federation (IPAF) will officially launch its 2019 global safety campaign at the giant bauma construction equipment showcase near Munich, Germany, 8–14 April 2019. This is an ideal opportunity to engage the European industry and promote safer use of MEWPs. Demonstrating the breadth of the Volvo Group, Volvo CE will be joined at bauma 2019 by sister companies Volvo Penta, Volvo Trucks and Volvo Financial Services. The companies' participation at the show is much more than a static display - it's a live event. Under the theme of Building Tomorrow, Volvo's 2,293m2 indoor stand in Hall C6 and 5,870m2 outdoor stand at FM714 will be a non-stop interactive performance featuring the complete product and service portfolio, for today, tomorrow and well into the future. Wacker Neuson once again held its popular Trowel Challenge competition at the 2019 World of Concrete, January 22–26 in Las Vegas. As the competition has continued to gain loyalty, many familiar faces returned to compete for the grand prize, a Wacker Neuson eight-foot CRT48-37V ride-on trowel. Over 100 operators from around the world competed for the fastest time as they maneuvered through the tight turns of the 1,750-square-foot course. Digital innovations are increasingly shaping our everyday lives – including in the construction machinery industry. Thanks to virtual and augmented reality (VR/AR), users can now experience construction sites virtually and be part of the story in the middle of the action. It is not just an experience with deceptively real sensations and high entertainment value. VR and AR can be used to present products in the development phase, prototypes, or future scenarios and explain them in a completely new way. This opens up a whole host of new opportunities for companies. Xtreme Manufacturing, is unveiling three brand new telehandlers at World of Concrete. DEUTZ Corporation will exhibit its growing, versatile line of engines at World of Concrete. As always, the company looks forward to this particular show and the many opportunities it presents. Liebherr USA, Co. Concrete Technology and Construction Equipment divisions are showing World of Concrete attendees the L 538 Wheel loader, 50 M5 XXT and the 37 Z4 XXT truck-mounted concrete pumps. Hyundai Construction Equipment Americas will feature a variety of recently upgraded models and newly available third-party attachments at World of Concrete (Booth C7027). The company is also displaying its Hyundai HX130LCR hydraulic excavator for the first time since the model's recent introduction. At World of Concrete, the Honda Power Equipment team will showcase a number of its power products for commercial applications at its outdoor booth #O31200. Front and centre will be the Honda comprehensive line of generators – models providing smooth, dependable power for construction, rental, emergency and recreation applications. All Honda generators are powered by advanced Honda four-stroke engines and incorporate technology that make Honda generators among the world's quietest. At World of Concrete 2019, the Honda Engines team will unveil powerful new additions to its general purpose commercial engine lineup – models that offer commercial construction and turf industry customers more versatile power and greater adaptability with exceptional fuel efficiency in a compact package. The Cyclone Air Cleaner, available on the Honda GX160, GX200, GX270 and GX390 engine models, features a smaller footprint and a more compact design than the legacy cleaner it replaced. The Cyclone Air Cleaner fits within the overall engine shape and targets OEM applications where overall engine dimensions are critical. The Honda GXR120 general purpose engine, a model uniquely developed as an ideal source of power for rammers – equipment used to compact soil or other granular material. Offered as a second power option to the reliable GX100 engine, the GXR120 engine is designed to provide superb durability and reliability for heavy-duty applications. Offering the same quality and durability attributes of the GX series engines, GX Pressure Washer Optimized Industrial Series engines are specifically designed for direct-drive pressure washer applications; the Optimized series is available with Honda GX160, GX200, GX270 and GX390 engines. The model lineup delivers Honda's smooth and reliable power, maximized engine performance at wide-open throttle and increased power output in the GX200 and GX390 series engines. These engines also offer a fixed throttle, enabling superior performance, making them ideal for the rental market. Manitou North America is introducing new products across its Manitou, Gehl and Mustang by Manitou brands at World of Concrete. An interactive outdoor booth in the Silver Lot (#O31054) features opportunities to meet the new management team and learn about the latest equipment and service solutions from Manitou, Gehl and Mustang by Manitou. Digitization is gaining ground in the construction machinery industry as more and more technologies make their way into the industry. Cloud-based infrastructures, digital services portfolios and security solutions are ringing in a change of paradigm. At bauma 2019, visitors can marvel at initial systems. From April 8 to 14, the world's leading manufacturers will be presenting their developments at Messe München and invite to participate in discussions on the opportunities and challenges of new technologies. The 2019 edition of the National Heavy Equipment Show is approaching this March 28 and 29 at the International Centre in Mississauga. With event preparation in full force, visitor registration is now live and the expanded exhibit floor is closing in on sold-out status. New technology and the work truck industry's continued emphasis on achieving zero emissions are the focus of the 2019 Green Truck Summit, held with Fleet Technical Congress and The Work Truck Show 2019, which run March 5-8 in Indianapolis, Indiana. Geographical expansion remains one of the main policy priorities of the Mecalac Group. For more than 4 decades, through its 5 factories, its 7 commercial subsidiaries and a global network of more than 250 dealerships, the Group has been designing, manufacturing and selling construction machines specifically intended for civil and underground engineering in urban environments. In 2016, Mecalac established a presence in the United States with an initial partnership in Massachusetts. Since then, its distribution network in the United States has expanded continuously. Consequently, Mecalac has now moved into the Canadian market with 3 distributors who now handle the promotion, sales and marketing of Mecalac construction machinery. The construction industry is increasingly showing interest in alternative drives for its equipment, one of several key trends surfacing as leading manufacturers prepare for bauma 2019 this April April 8 to 14 at Messe München, Munich, Germany. Mack Defense recently showcased the Mack Granite–based M917A3 Heavy Dump Truck (HDT) at the Association of United States Army (AUSA) 2018 show at the Walter E. Washington Convention Center in Washington, D.C. Mack Defense was awarded a $296 million contract in May 2018 to produce 683 HDTs for the U.S. Army. Haulotte North America held Open Days 2018, a customer event for U.S. and Canadian customers at their Virginia Beach, Virginia, location October 17 – 18. The event included education, hands on machine demonstrations including an obstacle course, and the opportunity to be the first in the U.S. and Canada to test drive the new HA61 LE PRO 100 percent electric architecture boom lift. Caterpillar will display 30 machines as well as work tools, engines and product support capabilities at bauma CHINA 2018. The extensive exhibit will feature Cat general construction, building construction, paving and SEM-branded equipment. More than a dozen Cat Next Generation hydraulic excavators will be introduced at the show. The who's who of the industry will be there when bauma CHINA opens its doors again from November 27 to 30, 2018, in Shanghai. More than 3,300 companies will present themselves at Asia's largest trade fair – 300 more than in 2016. Accordingly, 200,000 visitors are expected, which would be a new record. The Chinese construction machinery industry is booming as bauma CHINA approaches.